[This guest post was written by Stephanie Grace Stella, an associate in the Trademark Group at Wolf, Greenfield & Sacks, P.C.]. Delivering a lesson that not all things come to those who bait, the Board affirmed the PTO’s refusal to register the mark ICE BLIND for “ice fishing houses not primarily of metal,” finding it to be merely descriptive under Section 2(e)(1). Would you have appealed? In re IOIP Holdings, LLC, Serial No. 87250432 (September 17, 2018) [not precedential] (Opinion by Judge Albert Zervas). 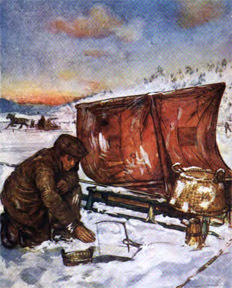 Examining Attorney Sarah Hopkins concluded that the proposed mark “merely describes a key feature of the Applicant’s goods, namely, [that] Applicant’s ice fishing shelters are used on the ice to conceal outdoor enthusiasts that are fishing from the elements and fish below.” The PTO relied on the dictionary definitions of the two terms in the proposed mark—i.e., “ice” as “a surface, layer, or mass of frozen water,” and “blind” as “a shelter for concealing hunters, photographers, or observers of wildlife”—and the Board took judicial notice of the definition of “wildlife” as “living things and especially mammals, birds, and fishes that are neither human nor domesticated.” The Examining Attorney "further relied on third-party webpages using the term 'blind' to refer to 'shelters' in the context of ice fishing" and using an additional term before the term “blind” to describe the type of blind, e.g., a hunting or fishing blind. Finally, the Examining Attorney pointed to Applicant’s descriptive use of the term “blind” on its own website. TTABlog comment: I'm afraid Stephanie needs to work on her punsmanship. BTW: the only fishing I do these days is for compliments. Text Copyright John L. Welch and Stephanie Grace Stella 2018. I dunno John, "not all good things come to those who bait" made me laugh out loud at 6:15 AM. Bravo. IP counsel yet. Maybe you'll get it. Like I said, it's a little weird. Gene: I cannot understand why you would appeal this. I think ICE BLIND is generic, let alone merely descriptive. I think Stephanie did a fine job. Ice Blind is no Snow Rake. Maybe not generic, but teetering on the edge of falling through the ice. I polled some sports fishermen in the Upper Peninsula where they know well from ice fishing - they all confirmed pure "G" generic.